Special 1: Ball Lightning – This ability is a sort of like a projectile time bomb. Press the button once to launch the ball in any direction, then press it again to trigger the explosion- or you can just let it blow up on its own. The ball lightning is great harass thanks to a moderate cooldown and decent damage, but it also has knockback for additional utility. Since the ball can be activated independently of attacking, you can throw it out and lead your opponent before they get to you, or just blow it up right in their face. This versatility allows you to use the ball in almost any situation; it’s also quite useful for checking bushes on levels that have them. On top of all this, it actually goes through anything: enemies, ground, towers etc, and can be upgraded up to to 70 damage. Special 2: Blaze – Blaze lays down an electric trail behind Coco’s hoverboard which damages any enemies which touch it for as long as it lasts, and leaves a “DoT” (damage over time) on them for a short time. This ability is pretty versatile, it can be modified to apply slow to enemies and/or boost the speed of Coco. 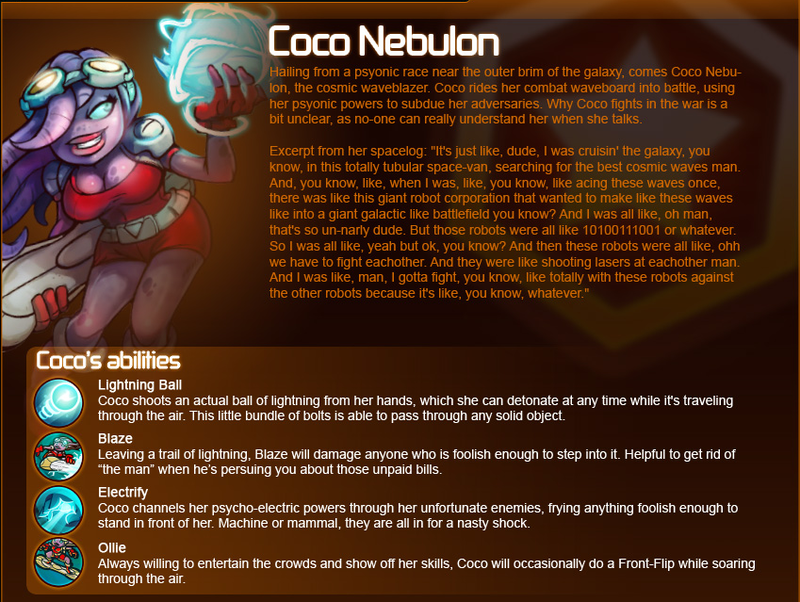 Unlike many abilities across each character, this ability is central to Coco’s playstyle, so you should upgrade this no matter how you intend to play. Blaze can be tooled to fit different playstles; upgrade slow for support or damage and speed for assassination, then mix and match with the trail’s lasting time and length. With speed and slow, wrap entire enemy teams in it to aid your team, or just lay down the pain in front of them as they attempt to run away. Blaze is a powerful ability; take it early, max it whenever. Coco’s fast, versatile, and her basic attack applies the sort of gradual damage that a true support needs. Unlike many characters who can for the most part set their own path and cause change around them with their builds, Coco is a support; like Voltar, she must respond to the composition of both teams. Blaze is her primary skill, and will be the focus of our build, but consider that her basic attack is valuable in large fights, and the ball lightning is great harass and burst damage. It’s a good idea to start off with both the piggy bank (duh) and the solar tree. Coco is not a killer, even with all her skills set to max damage, so you won’t be getting extra money from kills. At least you shouldn’t, but hey sniping with the ball can be quite lucrative. But that’s not now, that’s later, now is team composition. Coco has “team player” written all over her, so it’s important to work with your team. If you have characters like Derpl and Lonestar, bring the slow with blaze to help them secure kills. If you’ve got other supports like Voltar (and in most situations) max out the ball lightning first. Lastly, if you have no real pushers on your team (Leon, Derpl) put points in the extra tower damage for your basic attack as needed. Ideally, you’ll want to take both skills as soon as possible so that you can most appropriately respond to the enemy team as well as your own. If the enemy has a lot of quick, offensive types (Froggy, Leon) you’ll want to focus on Blaze’s slowing properties. If the enemy team has a lot of range or health, you’ll want to focus on damage from the ball lightning or your basic attack respectively. On average, however, a balanced team will best be dealt with by using blaze to hinder the enemy team and rescue your own (including yourself). Upgrade the self-speed of the blaze early so you can maintain usefulness in the early fights. Slowing the enemy down will prevent deaths and secure kills. Get health early if the enemy is bursty, but in most cases you’ll be able to focus on your ball lightning. It’s very important for Coco to stay alive as a support, even if that means dropping a kill sometimes (this will happen often since blaze can’t do damage to people in front of you). Taking the blaze speed increase relatively early is a good idea to help with survivability. Clean minion waves, push towers and keep your team mates alive for the early game. Pushing into the late game Coco will start to dominate at whatever role she chooses for herself. If you’re sticking to the plan, you should be maxing out ball lightning in general; 70 damage on roughly a 4 second cooldown is a bit insane, and the explosion size will seem unfair. Boost into fights with blaze and stack basic attack damage on top of the ball and lock down escaping enemies with the slow if it’s safe enough to get behind the enemy team. Always lead fights with the ball lightning, by the time you get into it or are escaping it you’ll have the ball up again for even more damage (or knockback, if you feel the need). Defend the lanes, and protect your team mates. Blaze’s ability to lay damage on a certain area is impressive, so you should definitely not be getting out-pushed, even by a Voltar and Leon combo. This is where the regeneration and health will come in handy, stay in the lane for as long as possible and ensure that your towers don’t go down. This process will not only farm gold for you, but it should setup great chances for ganks from your team mates, even if they’re under-leveled. It’s important to remember you’re aiming for late game here, Coco just needs time to build up.